Robert Theodore Bauer, better known to hockey fans as Bobby, was born February 16, 1915 in Waterloo, Ontario, one of 11 sports-minded children. After playing city hockey in the Kitchener-Waterloo area, Bauer moved to Toronto and attended St. Michael's College, where as a 15-year-old in 1930-31, he starred on the Junior B Buzzers, then graduated to the Junior A St. Michael's Majors for three seasons between 1931 and 1934. 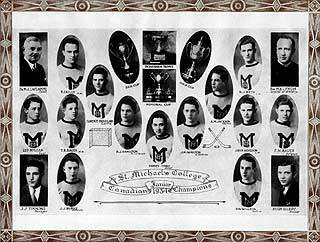 In his final season with St. Mike's, Bobby was a key member of the Memorial Cup-winning 1933-34 team, scoring 10 goals and 15 points in 13 games. That championship squad also included future NHLers Reg Hamilton, Art Jackson, Pep Kelly, Nick Metz and Bobby's brother, Frank. Lifelong friendships were forged in 1934-35 when Bauer played his final season of junior with the Kitchener Greenshirts. Joining Bauer at forward was Milt Schmidt, while Woody Dumart played defense. The three Kitchener-area lads were signed by the Boston Bruins, who placed them together on a line and sent them for seasoning to the Providence Reds of the IAHL in 1936-37. There, coach Albert 'Battleship' Leduc dubbed them the 'Sauerkrauts" because of their shared German heritage. That tag was shortened to the 'Kraut Line.' 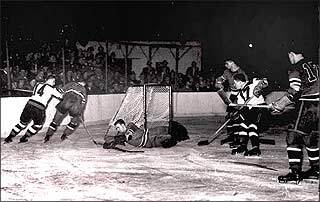 "Leduc was the one who gave us the name, the 'Kraut Line,'" recalled Milt Schmidt. "He said, 'All you fellas come from Kitchener/Waterloo. There's a lot of people of German descent from there. We gotta get a name for ya  the Kraut Line!' We didn't mind. It was a name that kinda stuck to us." Bobby Bauer played his first NHL game on March 21, 1937, the final regular season contest of the schedule for the Bruins. At 15:04 of the third period, he scored his first NHL goal, too. Reunited with Schmidt and Dumart on the Boston Bruins, the trio led the Bruins to a first-place finish in the American Division. Bauer scored 20 goals in that rookie season. The Kraut Line helped the Bruins dominate the NHL during the late-thirties and early-forties. Dumart, the line's leftwinger, owned a heavy shot. Schmidt, the centre, was a tenacious worker, equally adept at scoring, checking and leading the Bruins. Bauer, small by NHL standards at 5'6" and 155 pounds, was the clever playmaker. "Bobby was the brains of the line," said Dumart several years ago. "He was always thinking and a very clever playmaker." Milt Schmidt added, "Bobby was our team. He was my right arm." In 1938-39, the Bruins finished first and proceeded to win the Stanley Cup. Bauer was selected to the NHL's Second All-Star Team. 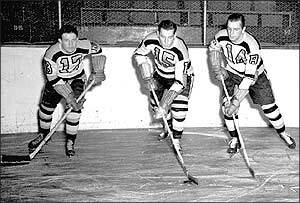 The Bruins finished first again in 1939-40, with the Kraut Line members finishing first, second and third in scoring. Schmidt was the NHL's scoring leader, collecting 52 points, while Dumart and Bauer finished second and third in scoring with 43 points each. "There are several reasons why we had success that year," explained Schmidt. "The three of us roomed together in Brookline, Massachusetts. We had one big room, so that we were always together. After practices, we discussed things that we should work on. After a game, we'd say. 'Well, we did this wrong or did that wrong.' There was no nightlife or anything like that. We really worked at it and I think that had more to do with the success of our line than anything else. To finish one-two-three; I don't know of any other line that did that before us and we were quite proud of the fact. Hard work  that was it." Schmidt was voted to the First All-Star Team, with Dumart and Bauer both elected to the Second All-Star Team. Bobby also picked up the Lady Byng Trophy as the NHL's most gentlemanly player. For a fourth straight season, Boston finished first in 1940-41. For a third consecutive year, Bauer was selected for the NHL's Second All-Star Team and for a second straight spring, was awarded the Lady Byng. The Bruins finished the season in suitable fashion and were presented with the Stanley Cup for the second time in three years. In February 1942, all three members of Boston's Kraut Line enlisted with the Royal Canadian Air Force. They played as a unit for Ottawa's RCAF Flyers of the Quebec Senior Hockey League and helped the team win the Allan Cup before flying overseas. In today's politically correct arena, a nickname like the Kraut Line would never exist. But the name came before the pronouncement of World War II. With the eruption of war, the climate became a great deal more sensitive. "When we went into the service in 1942, they held contests in Boston to do away with the Kraut Line name," explained Milt Schmidt. "The person who won called us the 'Buddy Line.' It didn't last very long," laughed Milt. A newspaper tried to call the line the 'Kitchener Kid,' but that didn't curry favour either. "After the war, we got back to Boston in 1945-46 and went back to being the Kraut Line again. It was quite a handle. We enjoyed it. We were all of German descent. My Mom and Dad were both born in Germany and came over to Canada at a very young age." Although away from NHL action for almost four years, Bauer and the Krauts returned and hadn't lost a step. All three finished in the NHL's top ten scorers in 1946-47, with Bauer enjoying a career year  30 goals, 24 assists and 54 points. He was elected to the Second All-Star Team again, and won the Lady Byng for a third season. Seemingly at the peak of his hockey talents, Bobby Bauer ended his NHL career. After retiring in 1947, Bauer returned to the Kitchener area and entered the skate business, while coaching the Junior A Guelph Biltmore Madhatters. Later that year, Bauer regained his amateur status and played senior hockey with the Kitchener-Waterloo Dutchmen, leading the team to the finals in three consecutive springs between 1948 and 1950. Bauer did return to the NHL for one final celebrated contest. Having not played in the NHL for five years, Bobby joined the Kraut Line for a final game together on March 18, 1952, the night their numbers were retired by the Boston Bruins' organization. Early in the game, Bauer fed a pass to Dumart at centre ice, who skated in and fired a shot on goal. The rebound came out just outside the crease and Schmidt pounced on the puck and drove it into the net. Dumart immediately grabbed the puck and handed it to Schmidt. It was Milt's 200th career goal and, appropriately, earned with the linemates with whom he had enjoyed his most glorious moments. 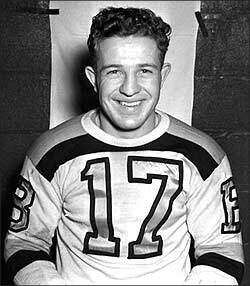 The public address announcer read the scoring play: 'Boston goal scored by number 15, Milt Schmidt. Assist, number 14, Dumart and number 17, Bauer.' The Boston faithful roared like they hadn't in years. Bobby Bauer scored a goal and an assist in that final NHL game. Bauer's career statistics, though good, don't tell the whole story. In 327 regular season NHL games through 7 seasons, he scored 123 goals, added 137 assists and totaled 260 points. Fittingly, he was assessed just 36 penalty minutes during his career. But the story that sustains is his contribution to the Kraut Line, arguable one of the best lines in NHL history. They meshed together like a finely-honed machine and helped the Bruins dominate the NHL pre-World War II; a verb they couldn't fittingly use again until the early-1970's. Bobby continued his involvement in hockey, coaching the senior Kitchener-Waterloo Dutchmen for a number of years. Beginning in 1952, Bobby took on the role of president, general manager and coach of the senior Dutchmen, and under his tutelage, the team won two Allan Cup championships as the top senior team in Canada. In 1956, the Allan Cup title earned the Dutchmen a spot at the Winter Olympics, representing Canada. The USSR was participating in the Winter Olympics for the first time and had a team entered in the hockey tournament. 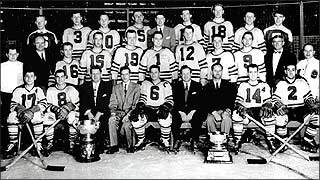 Olympic rules demanded that any athlete who had ever played as a professional was exempt from competition, so several former pros who had been reinstated as amateurs for OHA competition with the Dutchmen needed to be replaced. Bauer had no alternative but to drop former NHLers Clare Martin, Jackie Hamilton as well as three others and replace them with Junior B players. In that Olympic tournament in Cortina during 1956, the USSR took the gold medal, with the United States collecting silver and Bauer's Dutchmen claiming bronze. It was the worst showing in Canada's Olympic hockey history. Nevertheless, the Dutchmen were greeted by 4,000 fans when they returned to Kitchener, and the city hosted a civic celebration in their honour. The Dutchmen represented Canada again at the 1960 Winter Olympics in Squaw Valley, California. But it wasn't because they were the senior champions of Canada. In fact, the Whitby Dunlops had earned that title. But the Dunlops declined participation in the Olympics that year, and the Dutchmen were asked to take their place. Again, former pros needed to be replaced with amateurs. Harry Sinden of the Whitby Dunlops, later to coach the Boston Bruins, was added to the team as was future Montreal Canadiens' star, Bobby Rousseau. 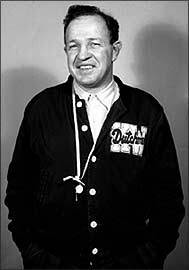 Bobby Bauer was not even intended to coach the Dutchmen that year. Hall of Fame netminder Bill Durnan had coached the team in 1958-59 and had started the next season behind the bench but resigned early into the season. Bauer stepped in, earning a second opportunity to attend the Olympics as well. The Dutchmen had a strong tournament, earning the silver medal for Canada, but it was the United States that took the gold medal while the Soviet Union collected bronze. After retiring as coach, Bauer continued as president of the Dutchmen. He later was a director of the junior Kitchener Rangers and, with old pal Woody Dumart, was a partner in a hockey stick manufacturing company. Then, while playing golf at Kitchener's Westmount Club, Bauer suffered a heart attack and died September 16, 1964 at just 49 years of age. The Kraut Line was reunited for one final time in 1996 when Bobby Bauer was posthumously inducted into the Hockey Hall of Fame. He joined linemates Milt Schmidt, who had been inducted in 1961, and Woody Dumart, who was elected in 1992. Incidentally, Bobby's younger brother, Father David Bauer, was inducted into the Hall of Fame as a Builder in 1989. Kevin Shea is the Hockey Hall of Fame's Editor, Publications and On-line Features.